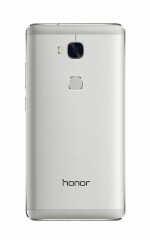 The Huawei Mate 8 was the star of Huawei's CES event, but the Huawei Honor 5X got an event of its own later on. It's coming to the US at the end of this month at $200, available from Amazon, Newegg and HiHonor. "Inspired by the shape and design of the famous Guggenheim Museum Bilbao," the Honor 5X has an aluminum alloy body that has been polished by diamonds with ceramic coating brushed on using a special technique. That's a premium manufacturing process on a surprisingly affordable phone. The phone comes with a 5.5" 1080p screen, an IPS LCD. Running EMUI 3.1 on top of Android 5.1 Lollipop, the 5X is powered by Snapdragon 615 with 2GB of RAM and 16GB storage (plus up to 128GB with a microSD card). A 13MP camera with f/2.0 aperture and 28mm wide-angle lens is paired with a SmartImage 3.0 image processor and shoots 1080p video. The selfie camera on the front is wider, 22mm lens, with 5MP sensor and f/2.4 aperture. Besides the metal body of the Huawei Honor 5X (which comes in Gold, Grey or Silver), the phone has a fingerprint reader on the back. The 5X is a dual-SIM phone with LTE connectivity. Again, it will be available in the US from January 31 for $200. Don't be surprised if you don't see a lot of Huawei logos, the company is trying to establish "Honor" as a brand in its own right. 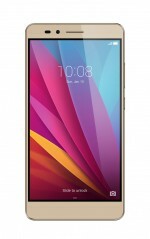 The Mi4c uses the 807.